When you are starting a new family and getting a new place for living, most of the times it’s not big. We are all looking for something small to start from and everyone seems to get a studio apartment as their first apartment. 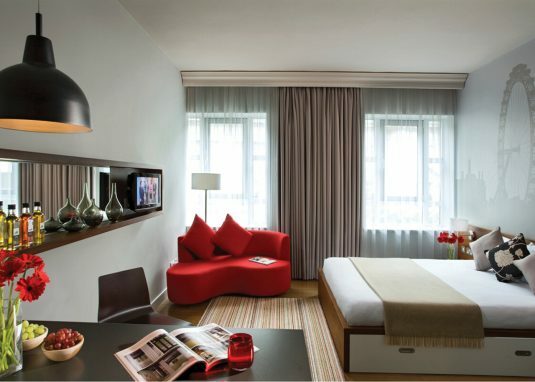 Here I’m going to share with you some Fantastic Studio Apartments That Will Impress You. 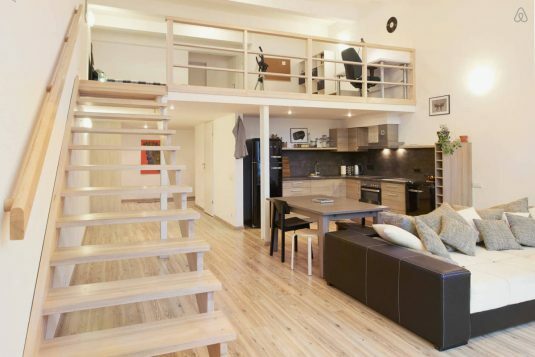 Although the space may be small, but it has big functions as well as the big apartments. 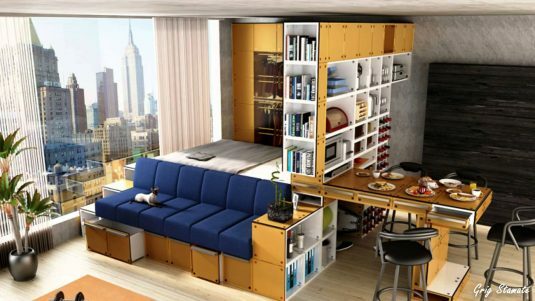 You can fit almost everything in the studio apartment, but you have to think smart and use the space to the best possible ways. 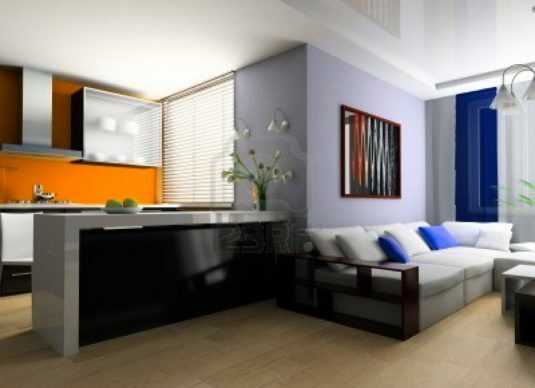 There are some great innovative solutions that are going to make living in the small places enjoyable and comfortable. 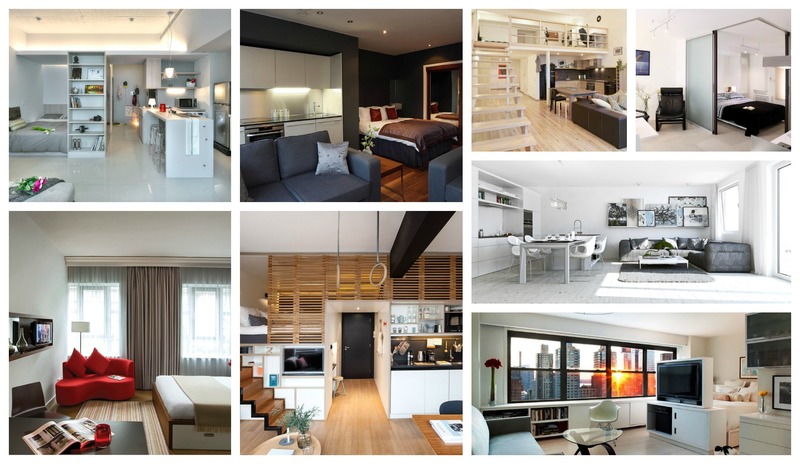 Check them out and see how you can decorate your studio apartment. Are you already excited? 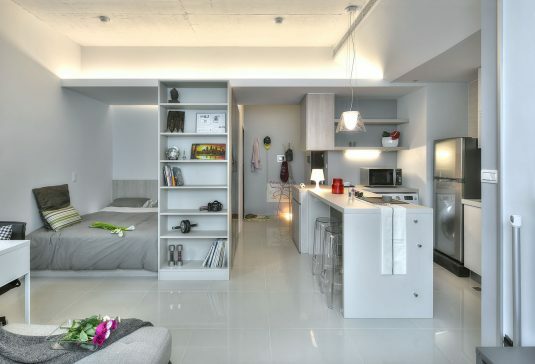 There are no walls in the studio apartment that separate the rooms from one another and everything is joined together. You have to pay attention to keep to the same style in the whole area. All the rooms form one unit, but there are still ways to divide the space. You should take room dividers and kitchen bars as possible ways to do so. When you are decorating the studio, the first thing that you should think about is your way of life. If you bring work home then a desk is a must. 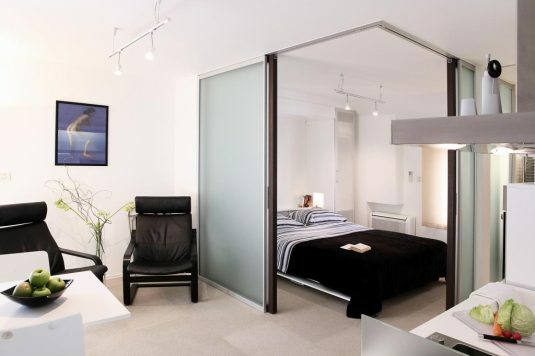 This glass room divider makes the bedroom zone as a separate area and makes it so much cozier and more comfortable than before. How do you like the idea? Separate the bedroom from the rest of the living area with this awesome TV set withing a minute. 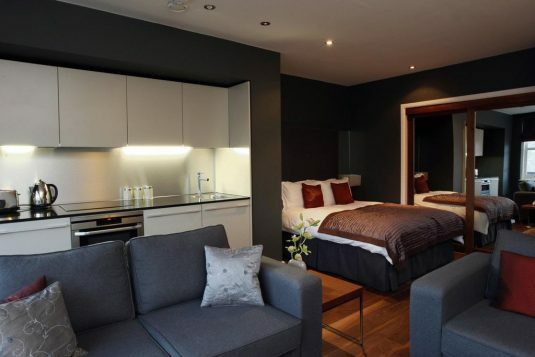 Plus, you can turn the TV around and watch television either from the bedroom or the living room. 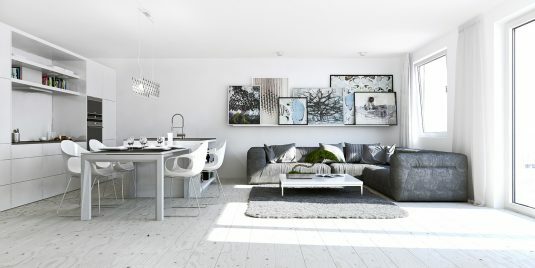 If you are a fan of dark colors keep in mind to add white furniture pieces as well because the gray and the black color can make everything look much more small. The mirror is another feature that will make the studio look larger. Join the kitchen island and the dining room table together to save on space. 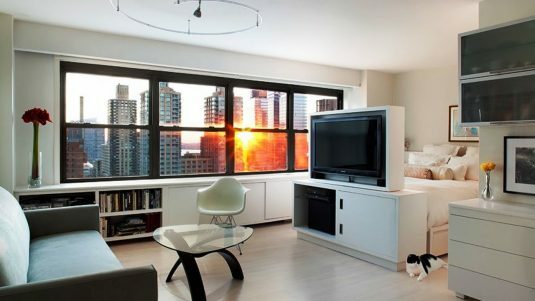 I’m in love with the apartment below. What do you think about it? 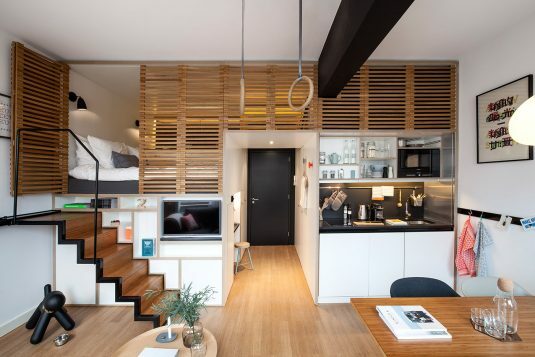 The small studio apartments use the vertical space, so make an upper floor in there and use it smartly. There are so many open shelves in the studio apartments and they are great since they help you divide the areas and you get plenty of storage space for your books and decorations. These designs are very unique and original and are going to give you some pretty great ideas. 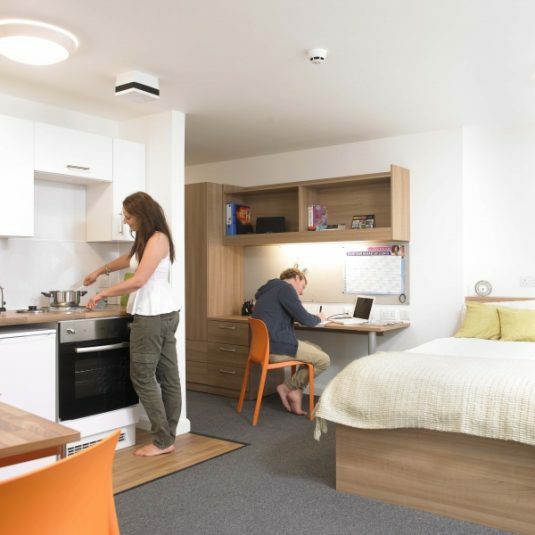 Choose studio apartments since the will give you the chance to live on a small budget and the cost in there are really low. Choose some of the designs that you saw here and decorate your studio in a fabulous way!